The idea behind the Orion pricing model was simple: scale your subscription with your business and pay only what you actually use. It’s what an honest pricing model should be, and your feedback was overwhelmingly positive. The only problem with the per site pricing model is that the price goes up really fast. Agencies with 50 websites would basically pay 5 times more than agencies with 10 websites, so there’s no real cost scaling. So we got back to the drawing board and came up with a way to improve the Orion pricing model. This article is about the bundles and a few other changes we made in the meantime. In addition to the per site pricing model, we added the bundle alternative. A ManageWP bundle gives you the ability to turn on a premium add-on on up to 100 websites for a flat monthly fee. So if you want to turn on the Uptime Monitor tool on 70 websites, you will simply take the Uptime Monitor Bundle for $25. You’ll also be able to turn on Uptime Monitor on another 30 websites for the same, fixed monthly price. Basically if you need a premium feature on more than 25 websites, get a bundle for that feature and save money vs. having 25+ websites with that feature individually. The initial pricing model was too expensive for people with hundreds of websites. We tried solving it with multiple discounts, but this only caused more confusion. Bundles solved this problem, so we simplified the discounts by keeping the only discount that matters: the Loyalty Discount. For every year you’ve been an active ManageWP subscriber, you get a permanent 10% discount, all the way up to 30%. We are also honoring all current lifetime discounts, of course, but they will not stack with the loyalty discount. The higher of the two discounts will be applied. Stay tuned for more updates about the pricing and the launch! Head of Growth at ManageWP. Marketing Manager at GoDaddy. WordCamp Belgrade organizer. But first and foremost, a father, a husband and a puck stopper. I don’t understand the confusion over pricing. To me at least, it appears that ManageWP have given us several great options. The options are designed to suit various sized WordPress businesses. A ‘one size fits all’ approach may appeal to some people, but we are all individuals with differing business models etc. 1. Want to pay nothing for any amount of sites? Then use the free addons only. 2. Want to pay a small amount per site for specific addons on a few sites? Then activate the specific addons only on the sites you need it on. Each addon is clearly priced. 3. Have a growing number of sites to manage and want to pay a fixed amount per site for specific addons? Then look at the bundle price vs what you would pay individually per addon, per site. ManageWP even tell you what the ‘break even’ number of sites is. Each bundle is clearly priced. Purchase the addon bundle and activate on the sites you need it on. 4. Have a healthy number of sites to manage and want to pay a fixed amount so you can add all the addons to every site you manage, up to 100 of them? Then look at the All-in-one Package bundle price vs what you would pay individually, or with a specific bundle, per addon, per site. Purchase the All-in-one Package bundle and activate everything on all the sites you need it on. 5. Have over 100 sites to manage? Pick from options 1-3 above until you are close to 200 sites and then purchase the All-in-one Package bundle and activate everything on all the sites you need it on. I understand the pricing and all, but what I dislike the most is ManageWp sold out to Godaddy. I manage 40+ WordPress sites and was looking for a “manage sites from a central dashboard” solution. I wanted to be able to perform backup and updateS without having to log-in to each individual site. Before pulling the trigger on iThemes Sync ($46/mo for 50 sites, billed annually = $552), + BackupBuddy ($98/year for 50 sites), I researched alternatives and happened on ManageWP. I’m glad I did – wow, what a difference! I can now manage unlimited sites for free, and turn on premium features per site as needed. I’ll gladly pay $2/mo to backup those sites that don’t already have daily backups (those hosted on client hosting plans) I calculated approximately $96/year. No brainer compared with $65o annually with the other solutins. I love the simple dashboard interface, and client sites need just the worker plugin, uncluttered with multiple, separate plugins. I am now looking into the other premium add-ons and loving what I see, all for a reasonable monthly cost. The pricing structure is simple, from my perspective. No confusion at all on per site vs. bundled. This pricing isn’t confusing at all. It’s well explained and fair. People talking about the daily backups being not cost effective simply didn’t read the part that states its an exception. I was bought here by wp elevation, and was excited to see what it costs, but bloody hell!! how many more people do you need to tell you that this pricing system is too confusing??? I was ready to buy but now I’m just going to walk away, I have no idea how much your services cost, and i fell like your trying to hide someting… please, just make it clear how much this costs!!!! I understand your pain – it’s not standard 1-2-3 pricing, since you can mix and match it any way you like. I can make a recommendation for you – what are the features you’re looking for, and on how many websites? 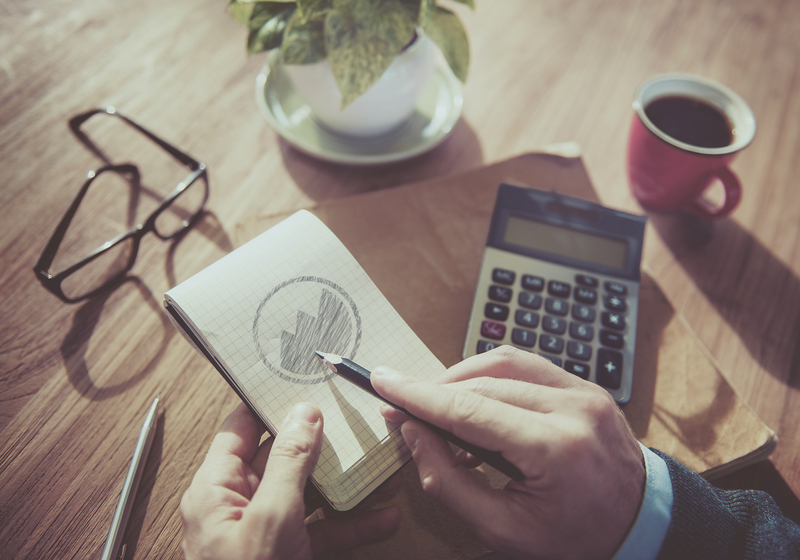 Yes – pricing seems too complex and is opaque for someone looking for a quick quote. This may be losing you business. Hello, I am a bit confused about the princing of the backup bundle. All other services are 1$ for 1 site, 25$ for 25+ sites. Backup is 2$/site, 75$ for 25+ sites. It seems if I have exactly 25 sites I will end up paying 3$/site if I go with the bundle. I would need to go past 38 sites for the bundle to be a better deal than the individual prices. This seems counter-intuitive. I think pricing it 50$ (2×25) would make it consistent with the other bundles. I understand the confusion – the backup price tag is there to cover the pretty high operating cost, that’s why it’s $2, and why the backup bundle breaks even at a much higher number than others. As a new user of ManageWP Orion I’me very pleased. Congratulations to the whole team for a good work. I also really don’t understand how can such a simple pricing model be confusing for some people. This is a really good deal, invested money adequate to the given value. Many features are free and the crital ones like backup are more expensive, but this is well justified taking in account its complexity. Backup system is very, very important and not so easy to mantain as it looks like. We have got also a rather good expierence with various hosting backup systems, cloud platforms (Dropbox, Google Drive, Amazon S3 etc.) and wordpress plugins (Duplicator pro, BackWPup, BackUpWordPress, UpdrafPlust, Snapshot etc.) and always we have some kind of problems. As for now with Orion everything run smoothly. …..upload to your own external destination (Dropbox, Google Drive, Amazon S3, OneDrive). This feature is charged separately at $0.13/GB. Why would you charge someone $0.13/GB to use storage that they already pay Dropbox, Google Drive, Amazon S3 or OneDrive for? If the bundle does not include real time backups (“it covers daily and weekly backups only”), then why include it in the bundle list? And if real time backups are not in the bundle, where do you get them and how much do they cost? If the backup bundle “covers daily and weekly backups only”, then what about the “on-demand backups”, which I assume are different from the “near real-time”, “daily” and “weekly” backups? How is that billed? How much does it cost? Why is there a cost to upload backups to my own external destination (Dropbox, Google Drive, Amazon S3, OneDrive) but not one to download the backup to my computer? Dropbox, Google Drive, Amazon S3, OneDrive don’t charge ManageWP for access, so why the difference? I don’t think I can go with ManageWP at this time. In my considerable past experience, whenever pricing is cloudy and convoluted somebody is about to get screwed – and it’s usually me. Here are all the answers you’re looking for. It’s because of the Amazon cost. Our Backups comes with free Amazon S3 storage, for both free and premium backups. But if we want to move something off Amazon (i.e. your backup archive to Dropbox), it charges us ~$0.12/GB. The download costs for us is the same as the upload to 3rd party storage, but we decided to eat the cost for you, since you should always be able to download your backups. Real time backup is an overkill for 99% of websites. So on one hand, having real time in a bundle would make it way more expensive, and on the other hand forcing everyone to use it is just as bad. When you turn on the Backup addon on a website, you’ll see the backup frequency slider. Just slide it to the “1h” on the far right. I agree that there are merits to the simplified pricing model, but we decided to give more control to you, so you could pick and choose only what you need. It’s harder to grasp since it’s not a standard way of doing things, but once you take a better look, you’ll realize that you’re definitely getting a great deal. Wow…this is really confusing. In one place it says you can get per site pricing for up to 25 sites. Then you can get a bundle for 100 sites. So far…so good. But then, the rep says in these comments that when you go over 100 sites, you have to revert back to the per site pricing for all sites over 100. What? Why would pricing go UP for loading more sites onto an account? This pricing structure is going to kill you guys. You’d be better off with a flat rate, for ALL add-ons, per site and no discounts. Web hosting businesses know what the sites cost them, and they can just add this cost per site (and add a % for their profit if they like). I’d much rather see a flat rate for ALL features at a single price. But, I don’t get why you think giving a % off for buying more licenses for more sites was more complicated than what you have now. If you have 1 to 25 sites, the WPManage add-ons (all of them in a single package – no pick and choose crap – buy it or don’t) are say $8 per site per month. If you buy 26 to 100 sites, the per site price drops to $6. If you buy 101 to 200 sites, it drops to $3 per site. Something like that is easy to understand. You have a good product, but your pricing/marketing is dragging you down. I hear you. That’s why we’ve decided to give two core features, Backup & Uptime Monitor, completely for free for websites hosted on GoDaddy. Combined with all the features that are already free, you have a killer combo for WordPress website management. The problem right now for me to start your service it’s that I don’t know how much will cost to me a single site when I add it. So make something like pay-as-you go would be better. So I know how much will cost me a single website and then can add this cost to customer. I hear you, and it makes sense. We’ll definitely have to do something to simplify our pricing structure. We run an agency, I was about to jump on board with all the websites we manage but I have to say, its too confusing, to much work and too much of a risk to jump onto your free version only to feel the sting later. Your pricing is a deal killer, so now I will stick with another WPMUDEV and pay them rather since their subscription is flat rate and makes sense with the same features. Your unclear pricing just lost you an agency account due to your pricing. Please just offer a flat rate for all of your plugins, per website. Done. Sold. Today. How would the pricing model work if I had over 100 websites? So you would get a bundle for a 100 websites, and then pay per site basis for additional sites. If you have a look at our pricing page, you will see both the per site price and bundle price. Say I have one website and I want it to be backed up daily and the size of the website is 1.5gb. What’s the price I have to pay per month? $2 only or is there anything extra that I have to pay for my backup storage on S3? $2/month for the backup on our own S3 (our storage is free of charge), and additional $0.2 for the optional upload to your own S3 destination. I really cannot see what all the fuss is about, the pricing modal seems fine to me. The free version is perfect for managing our client sites from one place, apart from that we have our own servers so features like Uptime monitor we already have, but I could be persuaded to move our ranking monitor to this one, but i cannot not see much information on the SEO features. Thanks for your input, Adam! The great part about it is that you can turn on the SEO add-on for just one website ($1/mo), and decide if you can benefit from it. Your pricing system is STILL IMPOSSIBLE to figure out. I can not figure out what it would cost to have managewp – only with backup/clone on 160 sites as a premium(? can NOT tell if it is included or not included), OR tell what that free version actually includes. And I suspect it is way over-priced anyway. SO we are not even going to bother to try to figure this out – it is the WORSE business model I have ever seen. We will NOT be recommending ManageWP to our list. For the premium backup on 160 websites (daily incremental, offsite backup, with S3 storage and cloning) it’s best to simply grab 2 Backup bundles, for a total of $150/month. Most confusing pricing I have ever seen. I am changing servers and all I wanted was to clone my sites over. Now about 5 hours later and dribble emails back and forth the only thing I have out of this so far is for 100 web site I am now paying 216.00 instead of the 120 I was paying on the classic, which they say I can’t go back too. Somehow I get a 20 % discount but that doesn’t show up anywhere, or maybe that is included in this price. Good service but at 216.00 a month US which is quite a bit more in Canadian dollars might be time to search for another service. Any suggestions out there? I’ll be happy to take a look at your current billing, help you bring the price down and make sure that you have the 20% discount. Could you email me at nemanja.aleksic at managewp.com? I totally agree with you in regard to the pricing which is indeed unnecessarily confusing. 3. You get (a-z features + these services for 150 sites Price/cost $ etc…. Keep it simple m8 !! I’ve got 30 sites atm and would like to place them all with MWP, but I’m with 1and1 Internet UK at the moment and for the price MWP are charging, I can have my own dedicated server for less than the price of their cost structure. The guys dont seem to be competitive at all, and one wonders whether they have looked around and seen what the competition is doing…..??? I get the strong feeling they’re on fly-by-wire at the moment with regard to their entire package. Also, I’ve never used GoDaddy, but I would imagine that they have in the past offered a lot of the same services for far lower costs…..maybe I am wrong but I wont spend any money here till I am convinced this is a good pricing deal….as you have pointed out in your comment….. I paid 132.72 dollars in June for a biannual licence to upgrade my account from the “free” 5 websites to 10 websites. Now I see its free for unlimited websites!!! Didnt even receive a courtesy free upgrade!! I wonder if manageWP management will have some decency to offer me to upgrade my account to the 25 websites WITH PREMIUM ADD-ONS!!! Feeling rather disgusted by your service! There are no courtesy free upgrades because the switch is strictly voluntary – if you want to stick to the Classic dashboard, you have every right to do so and retain your current subscription fee. However, if you want to switch to Orion, you can do so at any time, and you have the option of either sticking to your legacy plan, or fully switching over to the Orion pricing model. After you’ve settled, simply open a support ticket and tell our Customer Happiness team if you want us to refund you or move the renewal fee to your ManageWP Wallet. I got a notice that I have money in my “Orion Wallet” and that I can see that in the “bundles” section. I don’t see it.. Hover over your account name at the top right, and go to the Billing page. The Billing Info tab is where you’ll see the Wallet funds. This is really the worst pricing table ever seen. Everything is going one price for all, but this makes people calculate what they have to pay? Luckily, a lot other companies are offering the same services. I don’t understand how people are so confused about this pricing. It seems well explained and very simple to me. Pick whichever features you need for each account, and save money by not using all features for all clients. if you need a feature for more than 25 accounts, get a bundle for that feature and save money vs. having 25+ accounts with that feature individually. +1. And the harsh indignant tones as well. This new pricing system is way too complicated. I have no idea what’s going on, it isn’t explained anywhere near clear. I’ve red your article on pricing and am now even more confused. Can you present some sort of pricing table or calculator? Personally I prefer your old system and old dashboard anyway and will stick to it. Your new plan is going live in a few days and it looks like half of your clients have no idea how it works. An additional article is coming out tomorrow with user case scenarios that should clear up the pricing debacle! Hopefully tomorrow it should all be clearer. If you fancy it, you can tell us how many websites you manage and we can work out the price together? For those of us who have 500 sites (Business plan) this is a horrible deal. Currently it costs $420/mo for 500 sites with all of the premium(business) features. The article mentions a 10% discount for agencies who buy all of the premium features which would be equivalent to the business option now. For 500 sites on the new structure, this amounts to $787.50. Doesn’t seem like much of a deal at all to me. You can keep your legacy plan and you don’t have to switch to the new pricing. If however you decide that you don’t want to use the premium features on all of your sites, Orion pricing then saves you money. Either way, you can stick to what you like. I realize that you’ll be paying almost twice as much… but for all the service that you’re getting for less than $2 per website, you’re getting a huge bargain. Just charge your clients an extra $1 per month. Are you doing this all for free for your clients? I think it would behoove you to consult with an experienced business person who can provide guidance on this clusterf*ck of a pricing model. I’ll wait to see what happens after July 12, but I’m ready to pull the plug right now to be perfectly honest. Did you just use the words ‘behoove’ and ‘clusterf*ck’ in the same sentence? I have studied this and don’t understand the pricing model. I can see why people are reacting negatively but it isn’t that simple so far. I don’t mind paying for S3 storage for my backups. Are you saying that if I want to backup daily but store on my own S3, that i have to pay for that service in addition to my other charges? Yes I can appreciate that the pricing can be confusing. In one sentence, you pay per premium tool per website, unless you want a premium feature on more than 25 websites that you can purchase a bundle for up to 100 websites. This saves you a lot of money/year. With regards to your own S3 storage, that is correct, if you wish to upload your backup there you will be charged an additional fee of $0.13/GB. This is a cash grab. way too complicated pricing. I liked the old pricing and canceling my account and DL’ing a free backup plugin. I am sorry that you feel like it’s a cash grab, that was not our intention at all. We introduced the bundles to make it cheaper for those who are managing a significant number of websites. The idea behind the new pricing is to make it flexible and fully customizable to each users needs. If you want to run through the pricing for your account, you can contact our support and we can help you out in more detail. I can’t find the link to the calculator to check pricing on the new platform. This does seem confusing without being able to apply it to our individual accounts. I think that’s were the disconnect occurs. Can you provide an updated calculator so we can make plans before July 12th? I have a lot of clients I need to re-evaluate what I’ll need to have them on so it would be nice to have the information in advance. I’d be happy to walk you through it! Could you email me your needs (which tools on which websites) at nemanja.aleksic@managewp.com and I’d be happy to find the best solution for you. You can always remain on the legacy plan, of course. I currently have 8 non-profit sites created and run by me on a voluntary basis. As such, I don’t have an opportunity to pass on the costs of ManageWP membership. In an ideal world I could like to run 2 of these sides a on the Professional Plan and the other 6 on the Standard Plan. Is that possible with the new scheme? If it is, how do I set it up – have two memberships, each with a different email address? 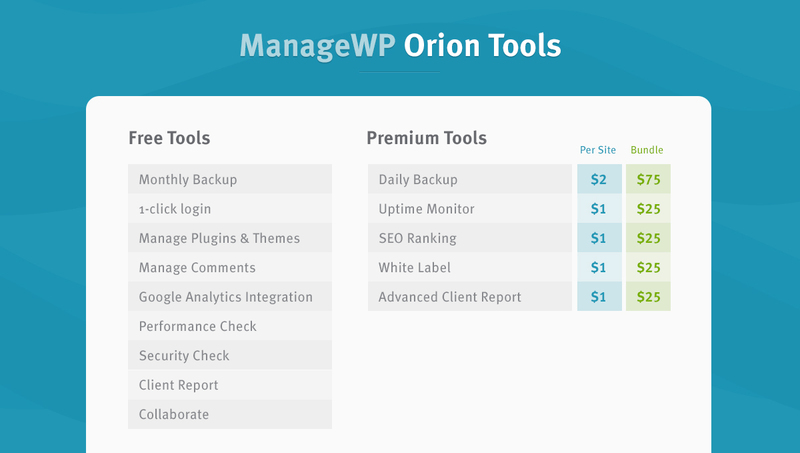 The great thing about Orion is that there’s no cost to be passed: you can have these 8 non-profit websites on your ManageWP dashboard for free, and you have a free monthly backup, just in case. If you really need the manual backups, you can always micromanage to keep the cost down: turn on the premium backup on these sites, run manual backups, and once you’ve done all the updates, turn off the premium backup. The total cost for all 8 websites will be less than a dollar, because we track usage on a daily basis. I paid for a year in advance with five sites. I only need premium for one and don’t really use all five spots. What is the best course of action for me? To I need to notify you with a requested plan? I prefer Orion to the Classic if that makes any difference. I can’t say for sure without knowing what you actually need and for which websites, but from what you’ve given me I’d recommend switching from Orion. On July 12 you’ll be able to cancel your legacy subscription and request for your pro-rated credit to be transferred to Orion wallet (this will be done either automatically or through our Customer Happiness team). If you’re still unsure about the move, just open a support ticket and we’ll be happy to look into your account and give you a recommendation! Is the price increasing for a small number of sites? Based on the screen print it looks likes the cost per site of the premium options would be $6. This makes 10 sites $60. Right now it’s $42. Is this correct? If so, that’s quite an increase! The main difference was because the Advanced Client Report was introduced early on. We have a bunch of improvements that we’ve yet to roll out, that weren’t in the Classic version. Without it, the difference would be $50 vs $42. And there’s also Orion Scheduled Backup that’s light years ahead of the Classic version. 1. You pay for actual websites, not blocks. So, if you have 8 websites, you pay for 8 websites, not 10. 2. You don’t have to take every premium tool for each website. Your development sites don’t need Uptime Monitor and Client Report, which cuts down the cost quite a bit and helps you keep everything in one place. You know what I liked about ManageWP? ‘This’ amount for ‘this’ many websites with ‘these’ features. I also liked the interface because it was clear, no excessive and grayed out graphics and a bunch of screens. If you have to write multiple blog posts to explain your pricing model, it’s too complicated. I want what I currently have, and if I need additional features for a particular website then add a couple of dollars to add the feature. End of story. That’s what you get right now: you can keep your current subscription, and if you need a certain additional feature, you can just turn it on in Orion. It should be fairly straightforward once you get your hands on it. Do you think that answers your question? I love the new features, but I also have some concerns about the new pricing model. I guess I will use the wait and see approach. I do wish the uptime monitoring worked properly, I frequently get notices that a site went down went it is still up. I too was getting false alerts –constantly– until some digging through logs found multiple hits from uptime monitor servers within the normal cycle (which for me is 5 mins). I then realised I still had Uptime monitoring enabled in the classic WP Manager, as well as in Orion. Once I disabled Uptime Monitoring in classic WP Manager dashboard, I don’t get the false alerts anymore. Firstly Orion looks great and I can’t wait to see the finished dashboard. We have a raft of websites with both live and development sites which run under sub-domains, can I ask if the final pricing model has settled on a per site or a per domain basis as paying twice for a single production site is not ideal, maybe there could be a discount on additional sub-domain / none production websites? It’s on a per website basis, but here’s the thing: just having a website on the Orion dashboard is free, so you can have all development websites there at no extra cost. You also don’t need scheduled backups for them, so there’s no operating cost. When you clone a live website to development, there’s still no additional cost (only the source site needs to have the Scheduled Backup tool). The only cost you’ll have is when you clone from development to live – you’ll turn on Scheduled Backup on development, clone it, and turn off Scheduled Backup. This way you’ll only need to pay a couple of cents, because Orion calculates usage on a daily basis. If Orian only calculates usage on a daily basis, does this mean that if I only run a client report once a month, I only need to pay for premium client reports the one day I run the report? There’s a free version of the Client Report, so you don’t even need to turn on the premium version to create a report. But yeah, if you want a Client Report without the ManageWP watermark, you can upgrade to Advanced Client Report for a day, do the report, and downgrade. We’re totally OK with that. Thanks for the clarification Nemanja, that certainly helps, will I also be able to bundle my websites into specific groups, so one group has the daily backups and advanced client reports and another group could have weekly backups and the free client report? Can I also assign backup options to the groups instead of to each individual site? Finally once Orion is launched will I be able to back up to my Google Drive as well as your servers? Sure, only it’s no longer groups, but tags and clients. If you offer one tier of service that has weekly backups, and another tier with daily backups and premium client report, you’ll simply tag these websites with a “weekly tier” and “daily tier” tags. You’ll then use the filter on the left to pull up only these websites on the main screen. So essentially it’s like groups in the Classic version, but much more flexible because you can assign multiple tags to each website. You will be able to change backup options in bulk. You’ll be able to upload backups to your own Google Drive, but due to the high cost of this option, it is charged separately – $0.13/GB. That’s pretty much the cost that Amazon Web Services charges us, and we figured it’s better to use this principle than to absorb it in the backup fee that everyone would pay, regardless of whether they’re using it or not. Let me know if you have any further questions, I’d be happy to help! Has anything changed about “grandfathered” accounts? Everything we promised remains – you’ll get to stay on your legacy plan, and decide on your own terms if and when you’ll switch to the Orion pricing model. The new backup charges seem like a bit of a money grab. The fact that I currently have a range of different backup configurations for daily, weekly and monthly is now going to cost me extra? The main reason I have this is because of the great backup configurations storing the data on external sources. I’m curious to hear what would be the advantage of having different configurations as opposed to having a single daily/weekly cycle? When do these prices go into effect? When Orion launch is my guess, seems logic. On July 12 you’ll be able to toggle premium tools and see the prices, but you won’t start getting charged for usage until August 1. One thing is that you have a point on constantly reinvent yourself, and for that i’m sure to commit with you as soon as you launch Orion ! Simple solutions, but great minds/jobs ! As a Prussian Field Marshal once said “no plan survives contact with the enemy”. It was the same with our pricing model, but the important thing is that we have a great pricing model in the end.